Any business that stands still ultimately goes nowhere. Savvy cigar shops look for manufacturer support that not only draws traffic but leaves a memorable impression. Heavenly Cigar's "Hummer Road Tour" ranks high on both accounts, courtesy of Heather Phillips. Company heads spend sleepless nights wrestling with new ways to tilt the competitive playing field more in their favor. Slogans, packaging, sales, and ad campaigns how can they fan the buying desires of retailers and smokers? Heavenly Cigar Company, maker of premium flavored cigars, has hit so many promotional home runs, one might second guess the need to maintain such momentum. But that wouldn't be the young company's style. "Our promotions are designed to benefit our loyal retailers," explains company founder and c.e.o. 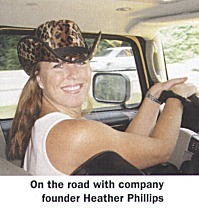 Heather L. Phillips, who first made sure product quality was perfected before turning her attention to standout marketing efforts. "We make sure they get our very best," she adds. As she lists the promotional ideas the company has implemented, one sees why their "Heaven" flavored cigar line is now one of the category's hottest brands. Phillips, 34, bootstrapped the company four years ago, after her employer, a posh cigar bar in Naples, Florida, closed unexpectedly. Bitten by the tobacco bug, she forged ahead on her own, with no formal business education and no funding other than her last paycheck, but with a generous helping of creativity, ambition, and guts. Creating the Heavenly Angels was her first promotional bombshell. Several of Phillips' close friends were members of a locally-touring dance troupe. Some began accompanying her at tobacco trade conventions, as well as retailers' and major sporting events. The Angels dazzled all they encountered, with their evening gowns and fluffy white wings. Their charm and beauty enamored onlookers, of course, but their in-depth knowledge of tobacco and cigars also impressed. Shortly, retailers clambered to book them into their stores. Racy wheels also helped garner attention. "I saw the new Hummer H2, and thought it would be ideal to transport us to and from cigar tastings and promotional events," Phillips says. "I selected a conspicuous bright yellow one, and added huge 'Heavenly' graphics. It sure catches the eye, especially when filled with high-spirited Angels!" Originally, she planned to only travel throughout Florida, later adding the southern states. On the beast's maiden voyage, Phillips and six Angels descended on three Florida tobacconists. "Just seeing the Hummer in the parking lot brought curious smokers to the door," says Tim Lynch of Tampa's Excalibur Martini Bar. "The Angels pulled them in like magnets." Lovely ladies alone can't ensure marketplace success, notes Jim Vaughn, manager at Key West's Tropical Republic Fine Cigars. "Heavenly's consistently excellent product and customer support makes their cigars the preferred brand here, outselling all others," he explains, noting that good product and sound account management are the base of Heavenly's appeal. But it's the Angels who really make the brand stand out, he concedes. "They and the Hummer were a real attraction. Guys couldn't pass by without coming in to meet them." Co-owner Neil Barberick, of golf-oriented Cigars and Pars, in Port Richey, Florida, notes: "Of the three cigar companies supporting our grand opening, Heavenly was the hit of the event. To drive the Heavenly Hummer the length of the state to support our new store shows their level of commitment to retailers." For Fort Myers Beach's spring break and parade, Heavenly supported their local tobacconist, The Cigar Hut. Eight waving Angels atop the Hummer, accompanied by nosebleed-level rock 'n' roll, helped put sales over the top for owner Stephen Light. "Heaven is our most popular flavored cigar, and customers always ask when the Angels are coming," he says. It wasn't long before Phillips was literally swamped with daily requests for the Angels. On a recent big tour, two Angels committed several months to the effort, visiting over 40 retailers in 15 states. The novelty of the Angels and their celestial chariot aside, it's really their level of commitment that explains their popularity with retailers, says Phillips. During a typical three-hour event, the Angels are never at rest: they meet, greet, and accompany smokers into the humidor, discuss tobacco and cigars, and explain the aura of Heavenly cigars. They gently coax non-flavored cigar smokers into trying theirs - most of the time, successfully. A sample often brings especially resistant smokers back for follow-up purchases. The Angels even go to the extent of strolling outside the store, in full regalia, to ensnare willing victims. The bright yellow Hummer, parked in front of the store with winged Angels nearby, does its share of building curiosity, as well. Heavenly is not stingy with the gifts and raffle items, either. In addition to the grand prize - about $150 worth of merchandise - Heavenly provides free cigars, apparel, and Angel calendars. The accolades followed them across the country, often with indisputable results at the cash register. "The event with Heavenly Cigar Company increased the business at least 30%," noted Mike Kahlil, of 8 to 8 Tobacco, Villa Park, Ill.
"Hosting Heather and the Angels was like no event we've had," admit Milo and Debbie Stubban of Milo's Tobacco Road, Edwardsville, Illinois. "We had a full house all night long, and customers are still talking about it. They're the best!" Retailers appreciate not only the instant boost in business, but also the indelible impression left behind. The eighteen-month "Heavenly Angels" calendar, which runs through 2004, is a large hit among customers, many of whom purchase one and then have it autographed to commemorate the event. Each page, covering two months, features two mini-poster sized studio photos of an Angel. The glamour shots are full-tilt seductive, but never lose their tastefulness, a principle that Phillips holds paramount. "Every one of the customers' wives and other ladies in the store commented that the Angels were not just beautiful, but equally poised and knowledgeable about their products," notes Cigars & Pars' Barberick. "The Angels and I give 110% of our energy, every minute we're in a store, to help the retailer build his or her Heavenly business," Phillips states. "With overwhelming response from retailers across the nation, Heavenly now maintains a waiting list for interested tobacconists. "With so many exciting new projects slated for 2004, a second factory near completion, and new packaging, we are working harder than ever to offer the ultimate in customer service," says Phillips. Another coup for Phillips has been Heavenly's Web site, which has proven an invaluable weapon in her marketing arsenal. The Angel of the Month photo gallery is one reason: it shows a different Angel every month, a continuous way to assure repeat site visits, the biggest challenge to Internet businesses. The site has just received an extensive upgrade, making it clean and simple to navigate. It is also more "personal," with photos and stories about the Angels, events, and other interesting topics. The custom "Dealer Locator" allows easy access to local Heavenly retailers, both U.S.- and foreign-based, directing business from thousands of interested smokers back to their local stores and authorized online retailers. Heavenly's extensive advertising campaign helps retailers build brand recognition. The company has also added several new flavors, sizes, and packaging concepts in 2003. Phillips hints at more new packaging, more flavors in their popular Torpedo shape, and a tenth flavor soon. Phillips modestly describes herself as "just a farm girl from Canada." But, Heavenly's marketing and promotional juggernaut reflects her vision and acumen in knowing what attracts, then sells. Many an MBA could learn lessons from her success, by practicing marketing as an art, not just a science.